Mudakathan Keerai is a herb that is commonly used in Siddha Medicine and has many health benefits to it. It is used to improve resistance/immunity, treat body pain, leg/joint pain and many more. It is also called as Balloon Vine in English and Harive Soppu in Kannada. 1. Combine the rice, ulundu, fenugreek seeds and toor dal. 2. Soak them for 1 hour and grind together with the keerai to a smooth batter. 3. Add salt to the batter and keep aside for 7 to 8 hours. 4. Heat little oil in a tawa. 5. Pour a ladleful of the batter and spread evenly. 6. Add little oil around the edges and cook on both sides. 7. Serve hot with side dish of choice. 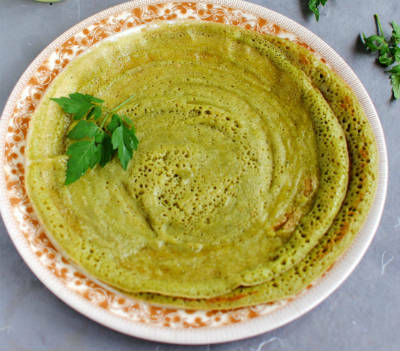 Feel free to comment or share your thoughts on this Mudakathan Keerai Dosai Recipe from Awesome Cuisine.